Common among moths is a mate-finding system in which females emit a pheromone that induces males to fly upwind along the pheromone plume. Since the chemical pheromone of the domesticated silk moth was identified in 1959, a steady increase in the number of moth species whose pheromone attractants have been identified now results in a rich base for review and synthesis. 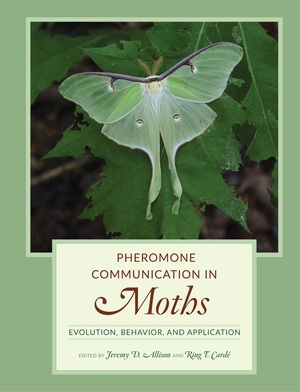 Pheromone Communication in Moths summarizes moth pheromone biology, covering the chemical structures used by the various lineages, signal production and perception, the genetic control of moth pheromone traits, interactions of pheromones with host-plant volatiles, pheromone dispersal and orientation, male pheromones and courtship, and the evolutionary forces that have likely shaped pheromone signals and their role in sexual selection. Also included are chapters on practical applications in the control and monitoring of pest species as well as case studies that address pheromone systems in a number of species and groups of closely allied species. Pheromone Communication in Moths is an invaluable resource for entomologists, chemical ecologists, pest-management scientists, and professionals who study pheromone communication and pest management. Jeremy D. Allison is Research Scientist with Natural Resources Canada, Great Lakes Forestry Centre. Ring T. Cardé is Distinguished Professor of Entomology and occupies the A.M. Boyce Chair at the University of California, Riverside.